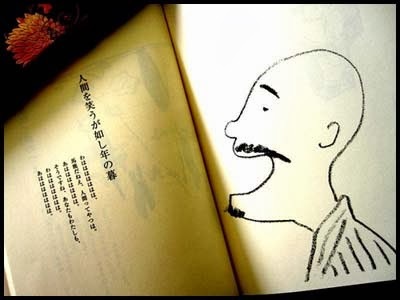 says that Shiki wrote more than 25,000 haiku. 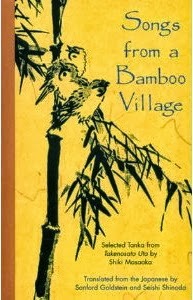 Different translators (Beichman, Blyth, Watson) mostly choose to translate different haiku, on the order of 100 each. Openness and naturalness in writing. 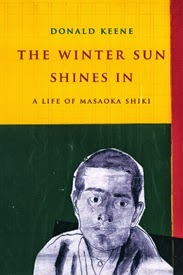 Advocated for and used the technique of shasei or "sketch from life", with open and natural writing that made minute observations of his surroundings, and created emotion in his work by manipulating the images he found. Flexibility in allowing him to draw upon scenes in his memory. A significant portion are tied to various particular occasions (occasional poems) that their meaning eludes today's reader. 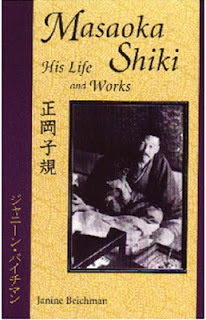 When Shiki began writing haiku, most haiku being written were satire, wordplay, or vulgarity. Rejected being bound by conventions to the past. 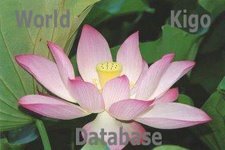 Rejected the older terms of hokku and haikai used for the 5-7-5 stand-alone poem, as those terms had been used for centuries in the context of linked verse, renku. Established the term haiku for the 5-7-5 stand-alone poem. Preferred factual types of haiku; highlighted those of Buson over those of Bashō.
. Masaoka Shiki - selected material.
. WKD : BIG font LINK . 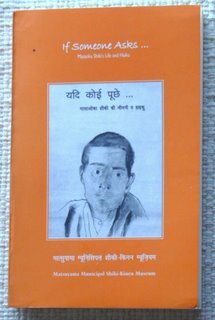 Hindi by Dr. Angelee Deodhar.
. Hindu Translation and Bilingual Publication . Gudabutsuan - "Home of the Stupid Buddha"
. Ritsu 律 his younger sister . 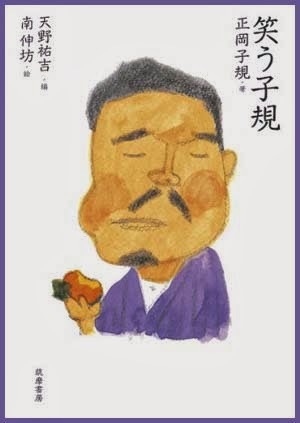 Matsuyama - with further links to Kukai, Haibun etc.
. SHIKI: The Discovery of Haiku .
. Shiki - Cultural Keywords and ABC-List .